This "close up" view of the private Large Sabal Palmate Frond from the Loyce Youngblood Estate depicts this pristine-preserved, giant 82" x 70" land-based palmate, incongruously draped over an apparent fossil fish at left center of main fan body. Other incongruities occurred nearby, with an obviously rapid, massive, intermingled burial of especially well-preserved birds, plants and fish in the 50-mile wide lakebed of the former ancient Fossil Lake in the Green River Formation of Wyoming [See Page 7 for debate about fossils in this formation]. Question: What kind of catastrophe might have created such a rapid mud burial on such a vast scale? Your ideas? Question: Is this Sabal Palm 50,000,000+ years old as the "Uniformitarian" geologists have claimed, or is it less than 100,000 years old, along with all fossils and the earth itself, as "Young Earth Catastrophist" scientists would claim based on new evidences from their 8-Year RATE Research Project? (See competing earth-fossil age views on pages 7 and 9). Five palm leaves at top mysteriously appear to be cut, torn, or bitten across in a straight line, since, even in the unlikely event that if insects happened to chew all the way through one leaf without eating other parts of the leaf, it is mathematically highly improbable that they would continue to chew off the other 4 adjoining leaves to the exact same length, again, without eating any of the other parts of those same leaves, especially since the remainder of the otherwise pristine-condition palmate fan body and leaves show very minimal insect damage elsewhere. Moreover, with the majority of the palmate's petiole (stalk) missing, this nearly 6-foot tall palmate was originally much taller (8 to 10 feet tall). Question: Since the five neatly missing frond leaves are at the top of this once gigantic 8 to 10-foot tall palmate, is it most probable that a very large grazing animal might have taken a big bite out of the top? Question: Straight-cutting Insects or tall grazing dinosaur? Your ideas? (Also see expandable close-up photo of palmate above). More photo views of the specimen available by email. 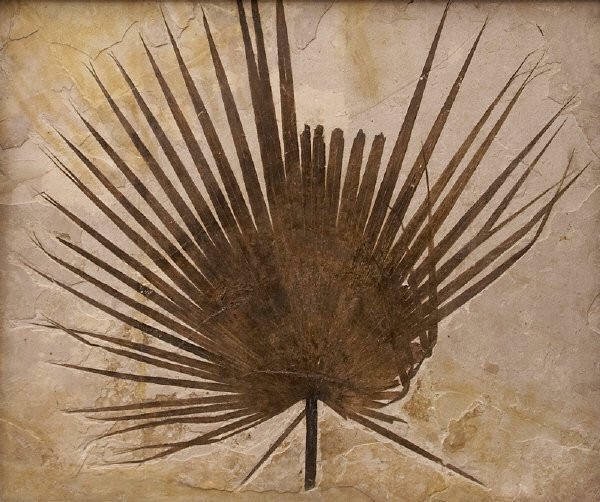 The private residential palm fossil was purchased for $92,800 in 1992 and authenticated by Charles E. Finsley, Curator of Earth Science of the Dallas Museum of Natural History in 1992. The $6933 museum-quality patinated bronze frame was added in 1998 bringing the total specimen cost to $99,733. It was appraised for estate tax purposes at $65,000* in 20071 . The fossil is offered for sale at $77,800 o.b.o. (Provenance: Loyce A. Wallace and Susan K. Thompson, joint owners). 1 Copies of the estate tax fossils appraisal, appraiser qualifications, and the fossil cost documents are available for inspection by approved parties. Also available are the $138,000 appraisal and cost documents for the other Large Sabal Palm Frond fossil donated by Mrs. Youngblood to Oklahoma University for the Youngblood Energy Library.. Your suggestions about this new website? Questions about the offered Large Sabal Palm specimen? Return to: Private Large Sabal Palm Frond background, Page 2.